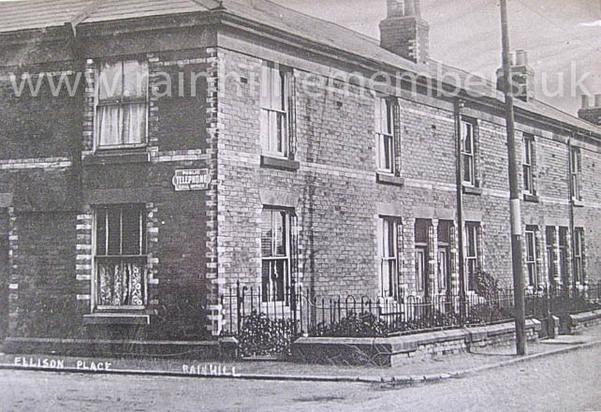 ​John lived at Ellison Place, on St Helens Road, Rainhill with his father and mother William and Louisa Critchley. He was listed as missing on 8th August 1916 and on 14th September was reported as a POW. He was able to write home saying that he was quite well. Three weeks before being listed as missing he was awarded the Military Medal for bravery on the field. "The following soldiers who were POW's in Germany have arrived in Holland for internment". The list included 11020 J. Critchley. Internment in Holland or Switzerland (neutral countries) was a half way house to full repatriation. The scheme got the POW's out of the rigours and treatment of the camps in Germany to enjoy a more comfortable existence albeit still in a confined environment. On 27th November 1918 he was released and arrived home in England. Ellison Place is a group of houses stretching from the corner of Ellaby Road along Rainhill Road towards Rainhill. This photograph was taken in the early 1900's when each house had its own small front garden. A newspaper article from 1918 explaining that John was a prisoner in Germany and had been awarded the Military Medal.